We’ve had two new lovely fabric arrivals here at Candid Owl; Sarah Jane has designed yet another fabulous collection for Michael Miller Fabrics, ‘Sommer.’ Featured here, we have two fabrics to make floral lampshades with – the ‘Plockade’ fabric in a rich dark blue and the ‘Garden’ design in a whimsical white pattern. Whilst we do love a pretty fabric lampshade, I have to admit, I believe a metallic lining added to most shades can really give it an added wow factor! For any of you who are not familiar with our lampshades, we hand make many of our shades with a metallic lining to create mirror copper lampshades and brushed gold or silver lampshades. These are available with all of our cotton and velvet ranges and with some handpicked patterns too. So what better way to introduce these new fabrics then to give a sneak peek into how we handcraft our metallic range lampshades! Our metallic lining is supplied to us in great big whopping rolls of 5 – 25 metres which are then hand carved for each individual lampshade. After much experimentation with different cutting techniques, we’ve definitely decided that Keencut’s Cutter Bar wins hands down. Whilst it is fairly bulky at 1.6 metres in length, it packs a mean punch when carving through large amounts of copper and brushed gold and silver. It is also supplied with multiple free replacement blades too so it just keeps on cutting. Once we’ve individually cut the panels for our shades, they are then adhered to the chosen fabrics. In this instance, I chose the brushed gold to make a 25cm diameter floral lampshade from the blue Plockade; I also picked the brushed silver to create a 20cm diameter floral lampshade from the white Garden. It’s such a shame that photos simply don’t do the brushed metallic justice – the light catches the lovely texture of it and reflects it beautifully when illuminated. And voila! 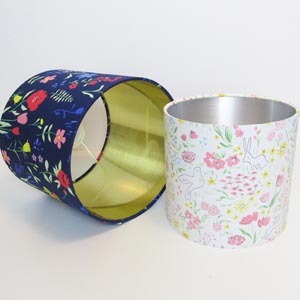 Two new floral metallic lampshades now added to the range and available to purchase here. Great to see behind the scenes! !